We all have model railroad stories we could tell - some funny, some not-so-funny, maybe educational or just unusual, or even heartwarming. 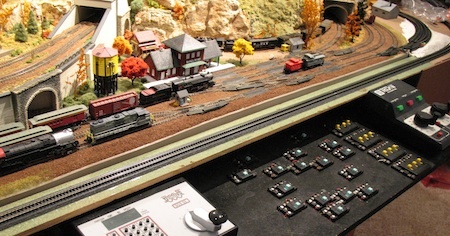 If you have a story to tell about your model railroad experience, let us know about it. As a model railroad enthusiast I have raised all my kids to respect the essence of what I call "my work" and they are not allowed to touch my railroad set if I am not there with them to supervise. This has been a long-standing rule in the home and if you have children you have probably done the same yourself. Protecting my railroad set and the investment I have put into it is the most important thing I can do. There is, however, a little story I want to tell you about. I had a friend visiting, an adult woman with her child. She had heard about my railroad set and wanted to know if she and her daughter could take a peek at it. I said of course, and proceeded down to the basement with the two following in tow. When I opened the door the three-year-old little girl stood there with her eyes shining and her mouth agape. She had never seen anything like this before and was amazed. I turned on the set, the train horn kits blew and the train began to clickety-clack down the rails. Well, I have never seen a reaction like the one I saw next. This girl let go of her mother's hand and headed towards my train set at full force. She started attacking it! She was trying to knock the train and the rails right off the table with a sweeping motion of her arm. Luckily, I reached her before she could do any major damage and only two cars, a house and a stop sign hit the floor. Also, I was fortunate that I had a rug set up underneath the table to break the fall. It was amazing that during this commotion the engine and one car attached to it continued to move around the track and the air horns continued to blow. It was as if nothing had occurred and the train continued to run despite somebody else's best efforts to stop it. Perhaps this is why I love trains so much! Needless to say, I grab the little girl and ushered her out of the room quickly. The mother apologized profusely and told me that her daughter had some destructive characteristics. I'll say! After they left I developed two more rules for my train room. The first one is that anybody, and I mean anybody entering my room will be screened first before allowed entry. The second one is that an adult will have to hold onto any child that I have not had the privilege to meet before while they are in the room. I am hoping that these rules will help further the protection I already have set up in place for my trains. I did learn something about my train set that day. The pieces that fell were fine, and as the horn train blew and the train went around the track, I knew that my train set had a spirit of its own that could not be broken. While I already "knew" that, it was nice to experience it just the same. You don't have to worry much about grammar or punctuation. We'll fix it up for you if necessary. It'll be fun to see your story appear on its own page on this site! From "Model Railroad Stories" back to "HomePage"